Delicious bacon and pepper-filled eggs inside a ring of delicious crescent roll dough. It’s our new favorite breakfast recipe! Having said that, today happens to be one I knew would be a hit and it turned out even better than we thought. In fact, It’s probably my new favorite breakfast dish because it was just so good and flavorful. This Breakfast Rings takes a little more work than your standard eggs and bacon, but trust me – it’s worth it. Although it takes a little more time, it’s really simple to do and turned out perfect!! I’m thinking this is what I’ll make on Christmas morning because it was just that delicious!! Make a circle in the middle and press dough together around the top edges. Add 1/3 cup cheese on top of bacon. Top with 1/3 cup more cheese. Wrap dough around. Top with melted butter and remaining cheese. 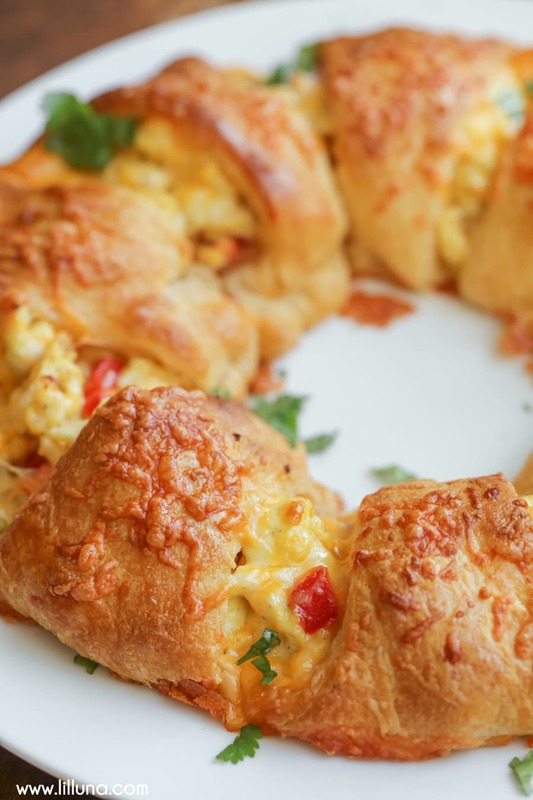 Cheesy Breakfast Ring - delicious cheesy, bacon and pepper-filled eggs inside a ring of delicious crescent roll dough. Its our new favorite breakfast recipe! Cook bacon and set aside (leave bacon drippings in pan). In a bowl, beat ⅓ milk, egg salt and pepper until well mixed. Add peppers and pour into bacon pan and cook until thickened through out but still moist. Set aside. Add parchment paper to a large cookie sheet. Unroll crescent roll dough and separate into triangles. Layer dough around making a 4 inch circle in the middle with the points towards the outside of the cookie sheet (see pic below). Press the overlapping dough together. Add bacon around the center of the circle at the tops of the triangles and top with ⅓ cup shredded cheese. Spoon eggs on top of cheese and add another ⅓ cup of cheese on top of the eggs. Add pointed ends of dough and wrap around eggs, tucking under the dough to form a ring (filling will be visible). Brush top of dough with melted butter and the remaining cheese. Bake for 20-25 minutes. Top with cilantro and serve warm. ENJOY! Mmmmmm…..yum. This looks totally amazing. I’m just starring at the screen looking at how delicious they look !! Haha…my thoughts exactly!! You’ll have to give it a try!! Thank you!! Thank you so much! We love it, too! So, happy to hear that! Thank you for trying it and letting us all know! I hope you like it! Thanks so much!! Hi Luna…Thank you so much for the Mexican recipes. I am very interested in making beef enchiladas and burritos if you have a recipe. Thanks again and Merry Christmas! Thank you. Beef burrito is what i would make. Happy Holidays!